​​​​I'm a goddess not a king! I'm a woman not a man! I honor Osiris not Abraham! ​​​​I'm a goddess not a prince! I'm a woman not a boy! I lead the justified into the presense of Osiris ! I am Osiris! My name and title written above: "Recitation by Osiris, Foremost of the Westerners, Lord of Abydos, the great god forever. I'm a god not a vile Asiatic! ​Blessed be the gods of Egypt! I am Hôr! I'm true of voice and vindicated before Osiris. I live forever in the afterlife with the gods as written in the characters above my hand: "The Osiris Hôr, justified forever". Shulem isn't even an Egyptian name! I am Anubis, a mighty jackal headed god. I usher Hôr into the presence of Osiris and the gods of Egypt. This is heaven's throne and a funerary spell for the blessed dead. I'm not Olimlah, a ficticious Egyptian name! I'm not a slave! The writing in the label above me testifies: "Recitation by Anubis, who makes protection, foremost of the embalming booth"
Cursed be those who slander me and make a mockery of the gods of Egypt! The written label below my feet is a sacred incantation to the gods of Egypt! 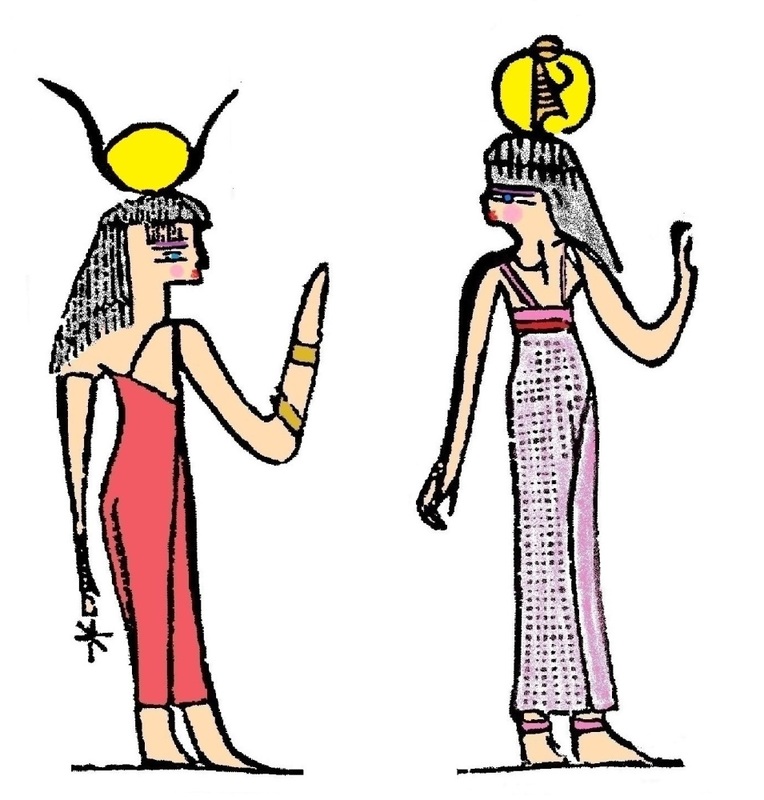 ​"O gods of the necropolis, gods of the caverns, gods of the south, north, west, and east, grant salvation to the Osiris Hor, the justified, born by Taikhibit." Let’s make sweet love and I’ll tickle you with your feather, baby. Hey Hôr, you’re such a strong man. You want to have a good time with me tonight? Osiris, honey, let’s copulate after the ceremony, I’m hungry and feel horny. Oh baby, you’re so hot. I love your dress and your horns. Hey, I heard that! I’ve got the ear of a jackal god. Girl, I love your dress! 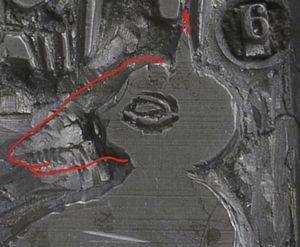 A close examination of the lead plates reveals that an original jackal snout carved by Reuben Hedlock was afterward hacked off in favor of a human head. ​​ Unfortunately, the original vignette is missing from the Joseph Smith papyrus collection so all that remains is the plate and the Facsimile it produced. Notice the jackal god Anubis only has a single ear and the head is less canine and somewhat human although if you look closely at the front of the face it almost seems like the nose was broken or deformed within the lead. This particular finding deserves some serious attention. It raises more questions about the papyrus and the handling thereof according to Smith's own liking. This is not good news for the church or its apologists. I suspect Smith instructed Hedlock to re-carve the plate on Facsimile No. 3 and get rid of the jackal snout. 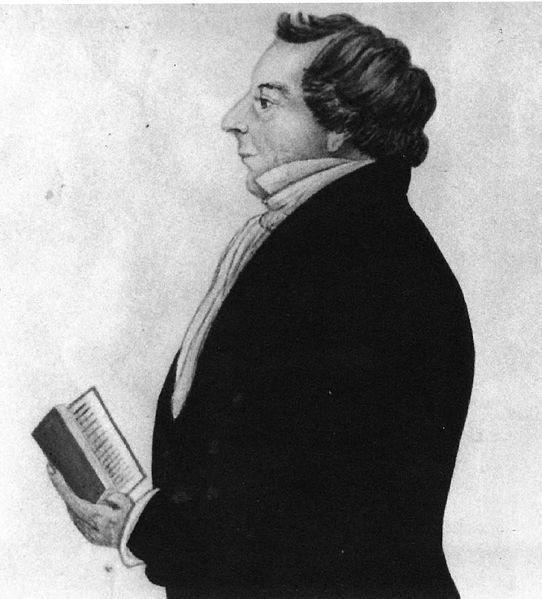 It becomes strangely clear while magnifying the image at THE JOSEPH SMITH PAPERS FACSIMILE PRINTING PLATES. If at first Hedlock faithfully carved an image of the jackal headed Anubis for Facsimile No. 3 as portrayed on the original papyrus drawn by Abraham's own hand, why would Smith get rid of the snout and make the face human? Why would Smith think to correct Abraham's original handiwork? Did he instruct Hedlock to chisel the jackal snout off the original lead prior to publication into the Times and Seasons? Magnification reveals an ample footprint wherein a jackal nose was first made but afterward redesigned under the direct supervision of Smith who was the editor in chief. It's a confirmed fact that the personage in the papyrus is none other than the jackal headed god, Anubis, as represented by the characters above his head: "Recitation by Anubis, who makes protection, foremost of the embalming booth". Church apologists have long touted how special the Facsimile No. 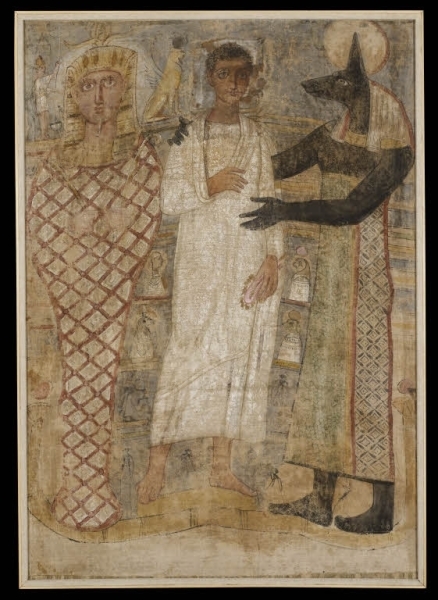 1 is wherein the Anubis character (priest attempting to sacrifice Abraham) is shown with a human head rather than that of a jackal. The controversy includes a section of papyrus that was broken or damaged and therefore Smith and his engraver had no way of knowing what the original head looked like. 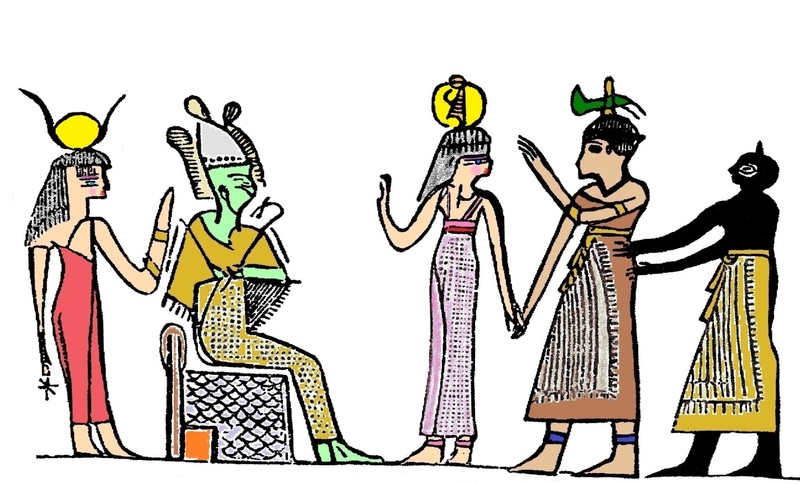 Egyptology rejects Smith's ignorant restoration of the figure's head which must have a jackal head according to standard Egyptian conventions in funerary art. ​Based on what you see in the enlarged plate, do you sense that there was a jackal nose originally carved and afterward removed? Which way do you tend to lean knowing what you know right now? On a scale of 1-10: 1 being there is no way there was a nose and 10 being there was most certainly a nose. With regards to Facsimile No. 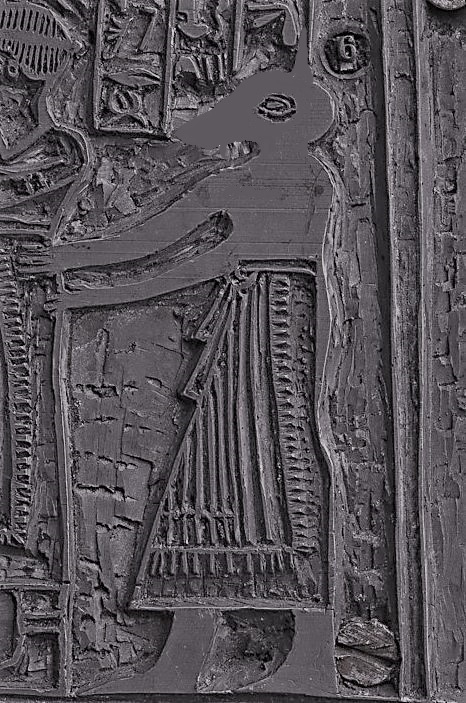 1, below, the head on the original papyrus of the so-called Egyptian priest (who is really Anubis) in Fig. 3, was in fact missing from the original papyrus that the Mormons purchased in Kirtland from Mr. Chandler. When the papyrus was unrolled it was damaged and the lucuna made it impossible for Reuben Hedlock to know that a jackal's head should be carved atop the person in the plate of Facsimile No. 1. It's important to note that the relief lead of Facsimile No. 1 proves that the skin of the person thereon was totally black as indicated by the high relief cut of the lead for the skin which transfers solid ink onto the paper during publishing, areas to include: Feet, legs, back, shoulder, arm. But notice that the face of the No. 3 personage in Facsimile No. 1 is not black! The relief carving is for a white person whereby when ink is applied to the lead a white face will appear. This contradicts the body by putting a white man's head atop a black man's body. Oh Snap! The height in the lead relief for the head of Fig. 6 of Facsimile No. 3 is consistent with the rest of the body whereby printer's ink applied to the high relief produces a totally black person. 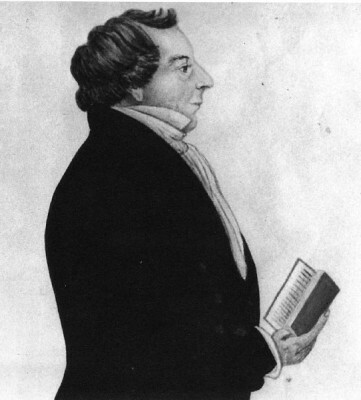 This means that Joseph Smith and Reuben Hedlock must have known that the figure in Facsimile No. 3 was that of a black man. But that was not the case of the black man in Facsimile No. 1, wherein they failed to produce a black head. It is argued that Smith and Hedlock failed to restore Anubis in Facsimile No. 1 with a jackal head because the head was missing in the original papyrus -- hence the lucuna. Smith and Hedlock did not know that an animal head was appropriate so they fabricated a human head. You'll recall that the human head they created is for a white man and they put it on a black man's body. A major blunder, wouldn't you agree? But what about the missing snout in Facsimile No. 3? An expert craftsman familiar with 19th century lead making techniques could explain the curious traces and patterns which indicate that something was chiseled out. The protruding V shape in front of the face is indicative of a jackal snout and the 5 vertical notches or strokes in a row therein seem to have been methodically produced by the intentional mechanical action of a sharp instrument in the hands of a skilled craftsman. All of this seems to indicate that there was something removed from the original design crafted by Hedlock prior to final publication. This of course, would have been approved by his supervisor, Joseph Smith. Look at the head above, do you see a human ear on Anubis? Why? Because the ear is that of a jackal atop the head! Look at the space behind the eye and it's clear there is not enough room to carve a human ear. An animal ear atop the head is the only valid interpretation in which to include an ear on this person. ​The Book of Abraham was printed serially in the Times and Seasons in three installments each supplied with a Facsimile. 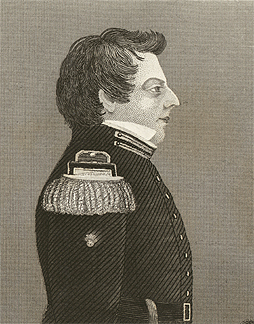 After the first publication, Smith was confident and proud of his work. Therein the first section of the Book of Abraham was published March, 1, 1842 and Facsimile No. 1 was the illustration including the Explanations. Congratulations to the staff of the Times and Seasons for getting it done and making the deadline. Special thanks to Reuben Hedlock for his craftmanship in supplying the lead plate featuring Abraham being sacrificed on the altar. Then came the second publication March, 15, 1842. 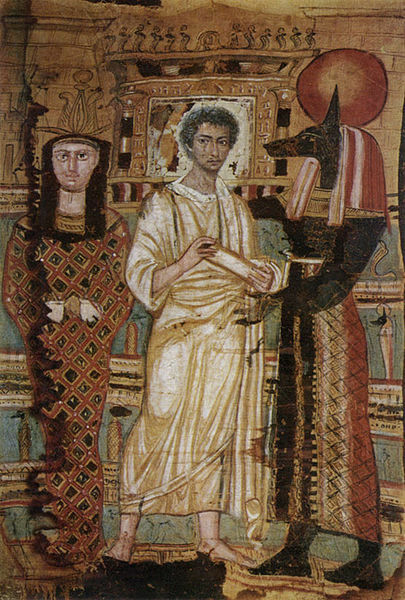 The second half of the story of Abraham was revealed including the illustration fabricated by Hedlock of the Hypocephalus, also known as Facsimile No. 2 with its accompanying Explanations. Again, congratulations were in order to all those who worked the printing press for their achievement in completing the second installment. Months later, on May 16, 1842 the final installment of the Book of Abraham was published and featured the Facsimile No. 3 thanks to Hedlock's third plate. The staff at the Times and Seasons must have been excited about the new publication pending the approval of the editor in chief, Joseph Smith. Hedlock's plate would have been set in ink to print a test sample of the Facsimile to see how it turned out. This I theorize is when Joseph Smith's heart went, thump! Something was not right. I think Smith was troubled about releasing the third installment consisting entirely of Facsimile No. 3 and its accompanying Explanations because of Olimlah, the so-called slave. 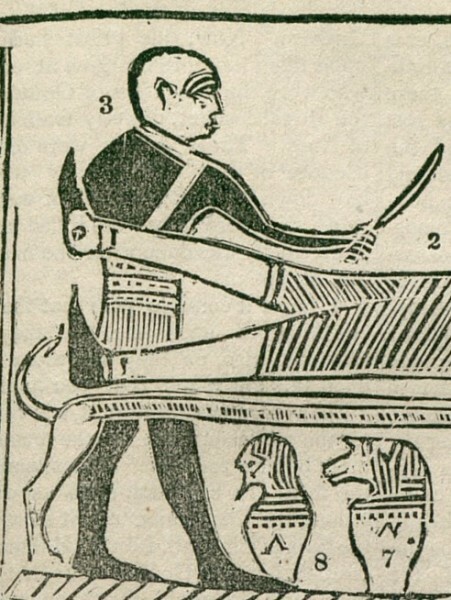 Joseph Smith realized that the jackal headed man-slave in Hedlock's third plate was very similar to the idolatrous priest of Elkenah who attempted to sacrifice Abraham on the altar as shown in Facsimile No. 1 at the beginning of the story. Smith was painfully aware that the original head was missing from the papyrus and that his professed revelations supplied a new head that was crafted by Hedlock. 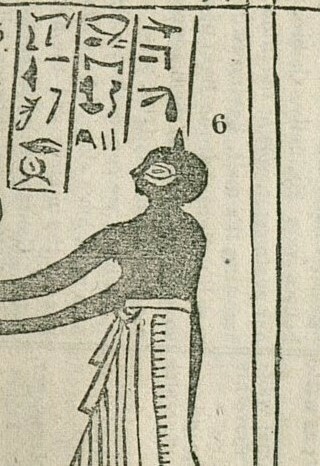 Smith began to worry that the jackal headed "slave" portrayed on the plate, faithfully copied from the papyrus was that of a black man and looked a lot like the priest of Elkenah -- it could be construed that the black men depicted in both vignettes on the same roll may be interpreted as being one in the same. It was too risky for Smith to allow the possibility of Abraham's assassin to be discovered in the king's court in the presence of Abraham sitting upon the king's throne according to the new Explanations therein. What might people think? The black assassin who was struck by Jehovah is now in Pharaoh's court! This simply cannot be. 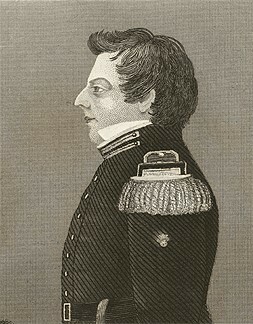 Smith was concerned that a connection could be made between the black men of his Facsimiles that were upon the Abraham papyrus roll. It worried him that it would appear that they were actually the same person and that would call his story into serious question. But what concerned him in particular was the jackal head on Anubis in the original papyrus that Hedlock had copied into the plate. What to do with the jackal head? I think Smith got the impression that the animal head was some kind of indication of status or importance. 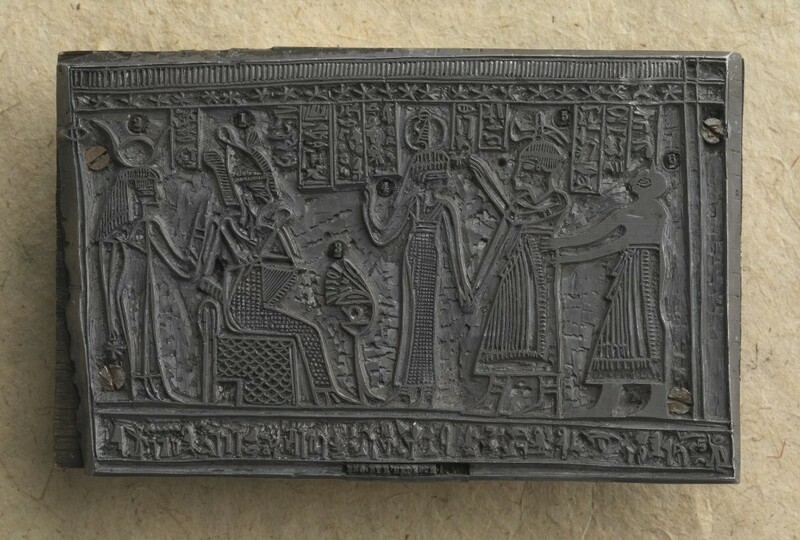 That of course would not fit well with the interpretation of a black man being a slave in the Egyptian court scene. Therefore, Smith instructed Hedlock to remove the black jackal snout and reconstruct a head more fitting for a slave. That way no one will know the better and suspect that the persons in Facsimile No. 1 & 3 may be one in the same. Smith must have also considered the animal headed characters of Facsimile No. 2 that signify important concepts such as the "dove" being a divine manifestation of the Holy Ghost as represented in Fig. 7. But most importantly, God sitting upon his throne, clothed with power and authority in Fig. 3 is adorned with that of an animal head. Not only that, the character in Fig. 1 also has some kind of animal head and this was figurative of Kolob in God's realm -- a matter of great importance. So, an animal head upon the head of black Anubis in Facsimile No. 3 may have seemed risky to interpret it as a slave. But there is more, the clincher, a bullseye, in making my case that Smith intentionally desecrated Anubis and committed wanton destruction to the Egyptian god in order to support his claim and story. There is a jackal in Facsimile No. 2 which may have given Smith alarming pause and great concern -- convincing him to get rid of the jackal-head in Facsimile No. 3. I refer to the animal headed person in Fig. 2 which signified the realm of "Oliblish" and in his hand he is "holding the key of power" according to Smith's own Explanation. Imagine that, the jackal being directly associated with power! That doesn't bode well with Smith's claim that the black man having a jackal's head in Facsimile No. 3 is only a slave. The key of power and the jackal are obviously symbols of authority and that contradicts the low station of slavery wherein one is at the bottom of the totem pole rather than the top where the jackal stands tall and proud. But Smith had already published the Facsimile No. 2 and the Explanations and the jackal therein had his power. The so-called "key of power" held in the hand of Oliblish (fictitious name) is actually an Egyptian totem or a standard whereon the animal-god Anubis (black jackal) stands atop the wooden framework of the pole. The role of Anubis was chiefly that of a mortuary god who ritually embalmed the dead in funerary mummy wrappings, guarded the tombs, and bore the title, 'Lord of the Necropolis'. 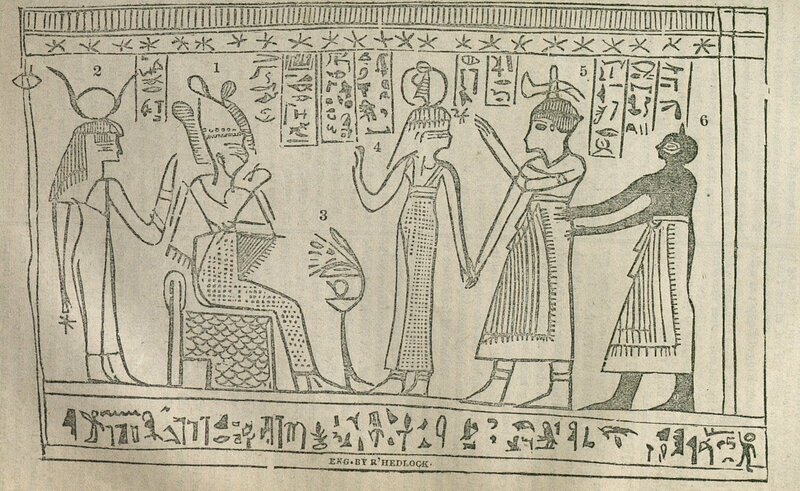 In the Joseph Smith papyrus the mummy is under the protective care under the standard of Anubis awaiting the promise of resurrection. 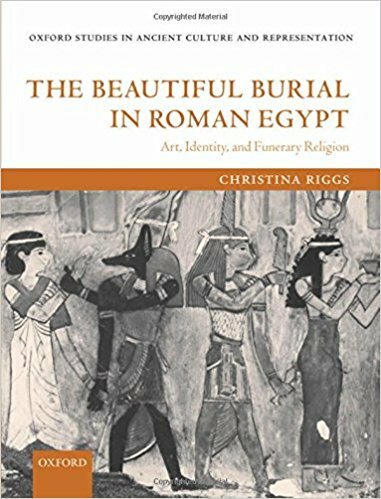 It is by the power of Anubis that the road to resurrection in the afterlife is opened and the deceased ushered into the presence of Osiris for resurrection and eternal life. 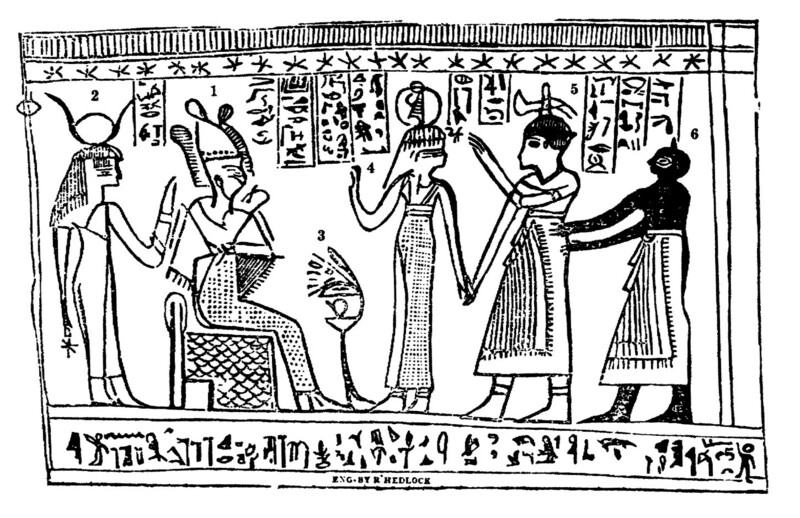 "According to Prof. Seyffarth, the papyrus roll is not a record, but an invocation to the Deity Osiris, in which occurs the name of the person, (Horus,) and a picture of the attendant spirits, introducing the dead to the Judge, Osiris"
Here we have the papyrus of Facsimile No. 3 being described in wonderful fashion! The man Horus is being brought into the divine presence of Osiris and the "attendant spirits" (Anubis, Maat, and Isis) are ever present. Professor Seyffarth was familiar with the Egyptian language using the most recent conventions thanks to scholars abroad -- and he certainly was able to recognize Egyptian deities.